(Bloomberg) -- Hong Kong’s equity traders can finally join their onshore counterparts in celebrating a bull market. The Hang Seng Index jumped 1.8 percent Monday, closing above the 29,502.64 level that was required to make the milestone official. The gauge, which had just completed its best quarterly performance in almost a decade, is now up 20 percent from its October low. Burned by last year’s rout, investors have slowly come back to Hong Kong, encouraged by surging risk appetite in China, a dovish shift in central-bank policy globally and heavyweight Tencent Holdings Ltd.’s return from gloom. The pace of gains has been nowhere near as fast as on the mainland, where returns remain better than in any other market in the world. All major indexes in China had already entered a bull market earlier this year. The milestone comes after disappointing results from some of Hong Kong’s biggest stocks had shattered hopes for a bull market last month. 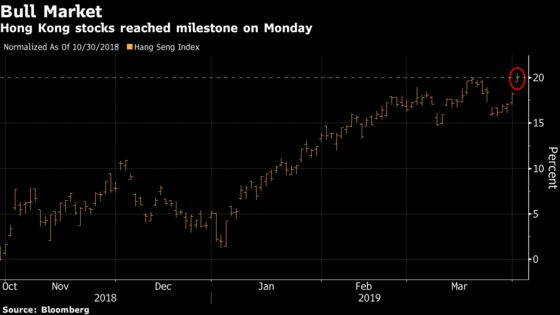 The Hang Seng China Enterprises Index, another gauge that tracks Chinese shares in Hong Kong, is only another good day or two away from achieving the same feat, up 18 percent since a low in January.